Get an Excellent Automatic Fire Suppression System from Flue Steam Inc.
Flue Steam is well-known throughout Southern California for its commercial kitchen air control and fire prevention services, which have been offered since the company’s inception since 1971. So many Southern California commercial kitchen managers have relied on Flue Steam to handle their commercial kitchen air control and fire prevention needs over the years. One of the most essential systems every commercial kitchen needs is an automatic fire suppression system. California law requires that every commercial kitchen have one in optimal working order 24/7. This is incredibly important to ensure the safety of kitchen staff, diners, and everyone else in the vicinity of your commercial kitchen. However, like any safety feature, it will only work well if you maintain it properly. Automatic fire suppression systems don’t do an ounce of good if they’re not kept in prime condition. At Flue Steam, our mission is to ensure commercial kitchens are as safe as possible at all times. That’s why we offer a whole range of commercial kitchen air control and fire prevention products and services, including everything you need to install and maintain your automatic fire suppression system in peak condition. Flue Steam offers complete automatic fire suppression system services, including sales, installation, maintenance, and repair. We’ll gladly help you select the ideal automatic fire suppression system for your exact needs. Then we’ll assist you with installing it perfectly for optimal effectiveness. We’ll also provide regular scheduled maintenance to keep your system in excellent condition. The best case scenario, for any commercial kitchen, is that the automatic fire suppression system will never be utilized. That’s the best possible outcome. Hopefully, your commercial kitchen will have an impeccable automatic fire suppression system for decades, and it’ll never actually be used to suppress a fire. But as anyone who’s worked in or around a commercial kitchen knows, the unexpected happens, and it’s always a good ideal to prepare for the worse case scenario. 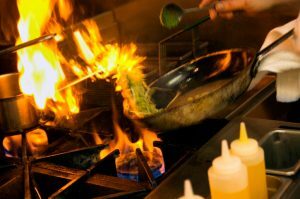 If a fire occurs in your commercial kitchen, the automatic fire suppression system will activate when the sensor detects a certain preset temperature – usually 450 degrees. At that point, the system releases an extinguishing agent to douse any flames on your appliance and in the plenum. In that same moment, the automatic shut-off valve cuts off your gas supply, which further reduces the chance of injury and serious damage to your kitchen. The automatic feature of of fire suppression systems is the main reason commercial kitchens need them, all systems are also equipped with a manual pull trigger as well. Don’t try to select, install, and maintain your automatic fire suppression system on your own. Flue Steam will make sure your system works optimally, complies with all relevant codes (including the UL 300 standard), and perform any maintenance tasks that are required by law every 6 months. There’s no need to deal with your automatic fire suppression system any longer – let Flue Steam handle it so you can focus on other pressing matters. You’ll be so glad you did. Contact us today by calling 800-700-FLUE. We look forward to making your commercial kitchen a safer, cleaner place to work every day.